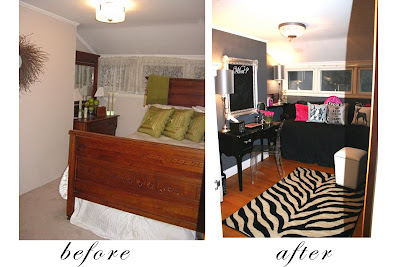 before: hum-ho, neutral guest room.. cozy and warm - but not so "wow". 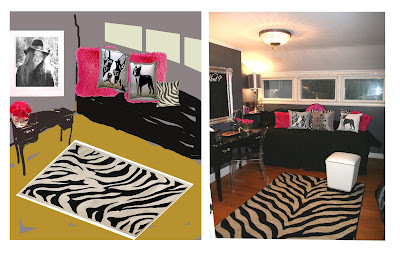 after: lounge-like, bold "teenager" bedroom, "dressing room" style - lots of drama and bling! everyone is very pleased with the results! and so, while her room & bed shrunk considerable,she gained a 10 foot closet space! my husband opened up what was once a very small closet and built a new closet into the entire lenght of the north wall - now flanked in gunmetal satin curtains her room feels like a "dressing room" - elegant and flashy! I'm reading: before and after...Tweet this! Oh my God, Shell!!!!!!!! I want to move in with you!!!! Chloe is one lucky girl! looks great! can you guys come down and help with the jules' room redux!